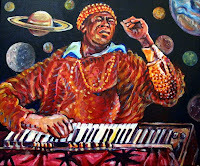 "The Other Worlds of Sun Ra,"
"There Are Other Worlds (They Have Not Told You Of)" - from the 1978 album "Lanquidity," Sun Ra's idea of an accessible funky groove album; this low-key funk song sounds like schizophrenic voices whispering in your head. God's Private Eye - Moog solo - utterly berzerk synth/keyboard freakout. "Outer Spaceways, Inc." - catchy tune featuring vocalist June Tyson. On a peer-to-peer, I found a remarkable unreleased recording from the early 1970s of Sun Ra & His Arkestra performing live at Widney High in Los Angeles. "Calling Planet Earth" - June Tyson leads the introductory call. "Theme of the Stargazers" - another Moog massacre; recording starts off crappy, but clears up. "Dr. Reggie Scott monologue" - someone describing the unhappy end to this show. Yes, this Widney High is the same school for mentally & physically disabled youth that, years later, would produce "The Kids of Widney High" albums of "special music from special kids." The Kids of Widney High - "Insects"
Can you imagine if the two groups had joined forces? Labels: children, jazz/improv, Space Age/Moog/Theremin etc.